A new Forklift Safety Tips poster from Hyster reminds those in applications and busy warehouses of the importance of safe, efficient forklift operation. 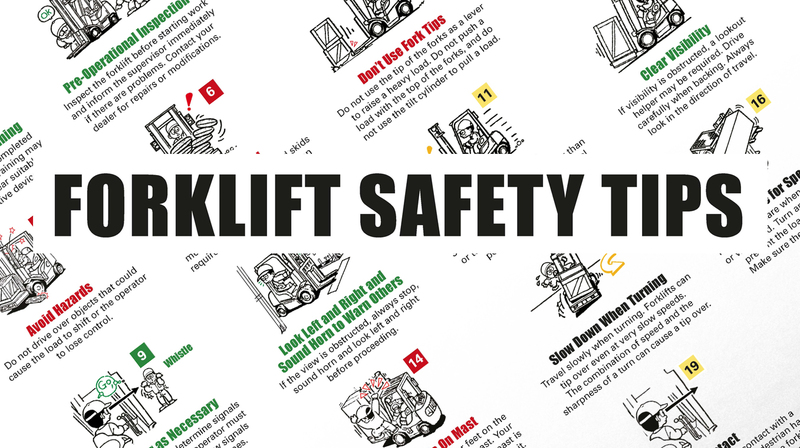 The poster covers many aspects of forklift safety, but here are four top tips for operators to consider before setting off on a forklift. Only operators who have completed the required forklift operation skill training may operate a forklift truck. Suitable clothing and personal protective equipment (PPE) must also be worn at all times when operating the lift truck. Operators must inspect the forklift before starting work and inform the supervisor immediately if there are problems. Hyster® forklift trucks are supported by a global network of local dealers providing service and maintenance support. Contact your dealer for repairs or modifications. If a seatbelt is available on the truck, operators should always fasten this before operating the forklift. A lift truck operator should pre-determine signals with a helper before they start work to improve safety, effective communication and smooth operation. The forklift operator must maintain sight of the helper at all times and follow all of the signals given. The Safety Tips Poster from Hyster is a handy reminder for operators and managers. However, operators must be trained and must read, understand and follow the instructions contained in the forklift truck operating manual. Forklift operators should also be supervised adequately during operations. For more information about Hyster® trucks, service support available from your local Hyster® dealer, or advice about on site safety, visit www.hyster.eu. This entry was posted in Big Trucks, Counter Balance, Electric, FLTA, Partners, Safety Tips, Tips and tagged Counter Balance, Electric, Hyster, New, Partners, Telemetry, Warehousing. Bookmark the permalink.